20 mm body length x . supplied with a 38 mm flat cam. Can be supplied in KA & KD sets. Nozzle rim drawer or till lock. Nozzle size: 18.5 dia. X 21 mm. Body size: 40 x 41.5 mm. Finish: nickel. 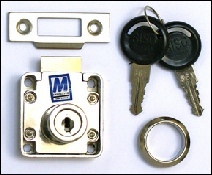 Supplied with 2 keys, striking plate and nozzle rose.